Our native Red foxes and the wild North American ancestors of domestic Silver Foxes are solitary hunters with hugely adaptable and varied diets. Rabbits, rodents and ground dwelling birds such as pheasants are usually their staple fare but foxes will readily eat frogs, invertebrates and wild fruits where available to them. Being opportunistic feeders has allowed the red fox to adapt to almost any environment, including urban streets and gardens where they dine on the spoils of human habitation. Whilst this willingness to utilise anything deemed remotely edible is a fantastic way to ensure they rarely go hungry, it can also result in the consumption of dangerous items such as rat poison, left over food containing artificial sweeteners, onions, grapes or other potentially damaging fare. The omnivorous, try-anything-once instincts of wild foxes remain strong in our Silver Foxes and so care must be taken to ensure that we only offer them safe foods and only offer treats in moderation. The odd digestive biscuit, cocktail sausage or left overs from your dinner wont kill your fox but a diet that regularly consists of low quality or risky foods will likely make him extremely poorly and shorten his lifespan. Here at KWR Foxes we recommend a predominantly raw meat based diet with the inclusion of a small amount of fruits and carbohydrates. The feeding of raw meat and bones is not a risk to either you or your fox so long as good hygiene practices are in place and the diet is balanced. The below is an example of a good, well balanced diet for an adult Silver Fox. 3 - 5% Liver - Liver is naturally high in vitamin A which can build up to toxic levels in the body if fed too often. 5 - 10% Heart - Heart is high in essential taurine which foxes can very easily become deficient in. 10 - 15% Bone - Chicken wings or drumsticks, lamb ribs or minced bone. 10 - 20% Fruits - Raspberries, blueberries, apple, banana, pears etc. 10 - 20% Carbohydrates - e.g Cooked sweet potato, pumpkin, white potato, cooked rice or oats. 30 - 40% lean muscle meats - Chicken, turkey, rabbit, pork, beef, venison, pheasant etc. Bones should absolutely always be fed raw and ideally be non-weight bearing. Chicken bones and lamb ribs work really well and are soft enough to be eaten. Cooked bones can easily splinter when chewed causing irreparable damage to the digestive tract. Raw Marrow bones can be offered as few foxes are capable of exerting the jaw pressure required to eat the bone itself although it'd still be wise to remove these bones once your fox has consumed all the marrow as it is potentially possible for him to break his teeth trying to crunch heavy, load bearing femur bones etc. These empty marrow bones can be re-used by stuffing with other food items and freezing before offering back to your fox. If you are concerned about correctly balancing a raw diet, you can order pre-made minces designed for raw fed pet dogs and add some fruit, carbs (if needed! An already fat fox does not need additional carbs) and small amounts of taurine-heavy heart meat or a taurine supplement designed for cats to ensure your fox does not become deficient. Raisins, grapes, onions, excessive amounts of garlic or any amount of artificial sweetener, chocolate or alcohol should obviously be avoided. 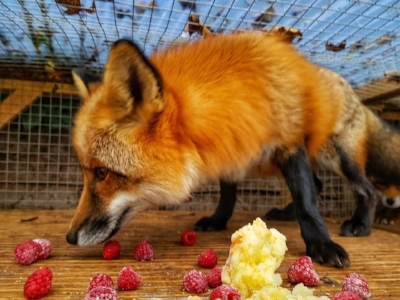 Dietary enrichment is an easy way for the fox owner to provide essential mental and physical stimulation in the form of uncomplicated food puzzles and if you're anything like us, you'll enjoy coming up with and offering these enrichments just as much as your foxes enjoy working them out! Here is a range of suggestions as to how to make your fox work for his food. Stuffed Kong toys - Fill with your foxes dinner, soaked kibble, scrambled eggs, raw mince or wet dog food. Freeze for longer lasting fun. Frozen Fox-cicles - Lolly molds and ice cube trays are incredibly cheap and can be filled with anything you can wedge inside them before freezing. Smoothies made with fox safe fruits, home made meat stock or bone broth, raw eggs, meat mince etc all work. Food puzzles made for dogs can be purchased online or from most large pet shops. Scattered and buried foods will encourage your fox to forage and feed naturally.